Personnel management is one of the most complex responsibilities of a leader. From hiring, to performance assessment, to coaching and personnel development, a leader has to be sure they’re getting and retaining the best possible team players on the job. But how can a leader find an ideal team player? Patrick Lencioni delves into this concept in his book: The Ideal Team Player: How to Recognize and Cultivate The Three Essential Virtues. 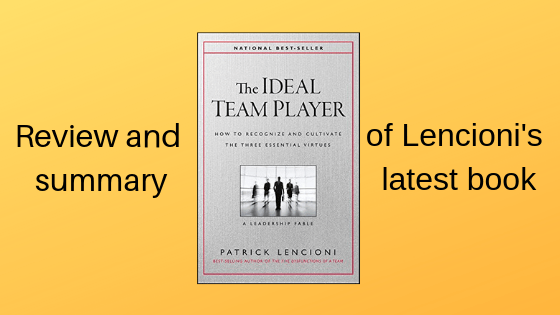 This book is written in the typical style of Lencioni: it offers an engaging leadership fable, followed by a detailed explanation of the underlying model presented. In this case, we follow the story of Jeff Shanley, who suddenly finds himself CEO of his uncle’s construction company. With several major projects ahead, he and his team face the challenge of finding the right people to meet the company’s needs. But what should they look for? What characteristics make someone a great team player? Jeff and his team are eventually able to identify 3 characteristics that make up an ideal team player. With those characteristics in mind, they conduct a successful search, finding the right candidate in their midst. In the story, the ideal team player is described as humble, hungry, and smart. If an employee lacks any of these characteristics, team dysfunction can crop up and derail the team’s performance. But what do each of these traits mean? Quoting C. S. Lewis, Lencioni writes, “Humility isn’t thinking less of yourself, but thinking of yourself less.” Humble people treat everyone on their team consistently, whether they’re dealing with their boss or people they supervise. They’re effective team members because they’re not ruled by ego and don’t have the need to always be right. But take note: too much humility can also be dangerous. People who are overly humble may decide not to share their ideas, or may refrain from calling out issues, because they think someone else always has a better suggestion. Humble (but not too-humble) team players demonstrate self-confidence without arrogance. They are highly coachable and willing to grow with constructive guidance. They know their worth, but are mature enough to accept when someone else’s proposal is better. “Hungry people are always looking for more,” says Lencioni. They’re highly engaged, responsible, and achievement-oriented. They’re not content with the status quo and are always on the lookout for something better. They seek wisdom from more experienced colleagues, and they’re willing to be coached or mentored in order to develop their skills more aggressively. As always, too much — or too little — of a particular trait can be a problem. People who are excessively “hungry” might prioritize their work life over everything else, including their health and relationships. On the other hand, team members who lack “hunger” tend to deliver the minimum that’s expected from them. They put in the necessary hours at work per day, but lack the self-motivation to do more. They constantly have to be pushed and prodded by their managers or team leaders. People who have an optimal level of “hunger” can cultivate life/work balance — excelling at work, yet still making time to savor relaxation and downtime. What Patrick refers to as “smart” is not being an intellectual, but rather being “people smart.” People with this trait are aware that what they do or say can affect those they work with, either positively or negatively. They can perceive what a given situation calls for and act accordingly. But beware, there are also people who are good at reading others’ emotions for their own gain. They can charm others to their own way of thinking, to swing situations for their own benefit. These are what we can call “charmers” – don’t fall into their trap! I recommend this book to leaders and HR practitioners. First of all, I love the fact that it’s written as a fable. The human brain is wired for stories. The story format makes this book appealing and memorable to readers. Aside from that, there’s also a framework section that explains the model in more detail. It even gives definitions of team members who lack one or more of the virtues (e.g., The Skillful Politician is hungry and smart, but not humble). Plus, the book provides tips on how to apply the ideal team player model in an organization. At Happy Brain Science, we prefer books and other sources to be grounded in scientific data. This book is not. However, I still find it useful as it delves into attitude and behavior – both of which are highly studied by psychologists. If the 3 virtues fit your company, and you have the time to find the ideal team player, I encourage you to read this book and study how it can be applied in your organization. 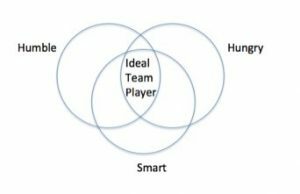 What is an ideal team player in your organization? What values and characteristics do you look for? Please let us know through your comments!